On 30 January, a dam failure in a tailings pond near Baia Mare, Romania, resulted in a spill of 100,000 cubic meters of liquid and suspended waste containing about 50-100 tons of cyanide, as well as copper and other heavy metals. The solution spilled into the Sasur, Lapus, Somes, Tisza and Danube rivers (finally reaching the Black Sea). The affected facility was a company jointly owned by Australian and Romanian interests that mined the area for gold and silver. The process and technologies used at this mine were considered to be the most modern and efficient in the region. The company was operating in line with government permits. The accident at the S.A. Aurul company was reported to the site management by a site worker at 22.00 on 30 January 2000. The Aurul plant stopped operations and the central and local authorities were notified. Sediments from a nearby tailing deposit were used to seal the breach, which the local authorities record as being partially closed by 01.30 a.m. on 31 January 2000. A controlled discharge of 40-50 L/s continued to leak from the dam, this discharge was neutralized with sodium hypochlorite until the breach could be completely sealed. The south west side of the dam was reinforced using the same material. 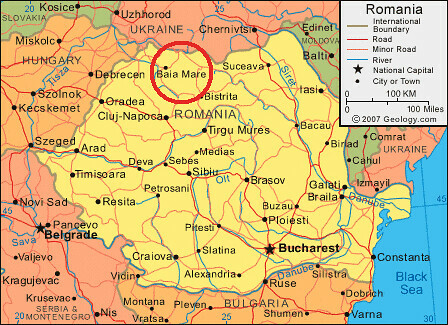 The spill initially entered the Sasar River near Baia Mare, and then flowed into the Lapus River before joining the Somes River which crosses the border with Hungary. The Somes joins the Tisza River which flows through Hungary. Traveling at 2.1 km/h–2.4 km/h, the pollution took 14 days to reach Tisza, some 800 km away. The Tisza is a tributary of the Danube and the pollution flowed into the Danube upstream of Belgrade and continued for a further 1200 km at 2.4 km/h–2.9 km/h before entering the Black Sea. Totally, some 2,000 km of the Danube catchment areas were affected by this spill.